Unique sun baked Mountain Contemporary retreat nestled on .78 generous acre lot in the heart of Hiwan Golf Club. Come see the vaulted ceilings with floor to ceiling windows with 2 sets of sliding glass doors for you to slip onto 500 sq feet of decking that offers sweeping views of the mountains from all angles Ample outdoor and 2 more patios and decking provide for maximum outdoor entertaining and allow for enjoyment for all seasons. Enjoy 3 natural wood burning fire places on each level that not only provide for the coziest of environments but also gives a great radiant source of heat and allows one to control the overall energy consumption which is fabulous for utilities. 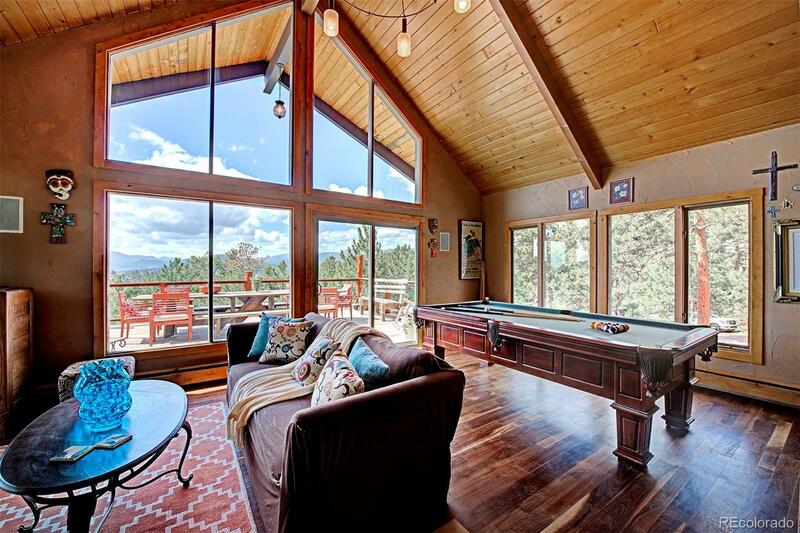 Character flows in the large eat in kitchen and open dining area that provides more sweeping views of the mountains and boasts wood burning fireplace. Views, location, character, and style will bring the serenity you have been dreaming of!